A comprehensive staff report the Sarasota County commissioners requested in November about the status of the Advanced Traffic Management System (ATMS) still does not provide all the answers Commissioner Christine Robinson was seeking. 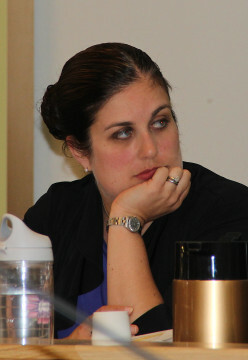 She hopes to get that extra clarity when the board holds a discussion of the report — at her request — during a February meeting, she told The Sarasota News Leader. Leigh Sprimont, commission services manager for the county, said in a phone interview with the News Leader this week that she expects the discussion to be scheduled in February, because agendas are full for this month. She added that it was too early, however, to predict the February date for which it would be set. During a Nov. 17, 2015 discussion of county priorities for the Sarasota/Manatee Metropolitan Planning Organization (MPO), commissioners voiced surprise and then anger after staff members told them that traffic signal timing was not being adjusted as ATMS phases were being installed. 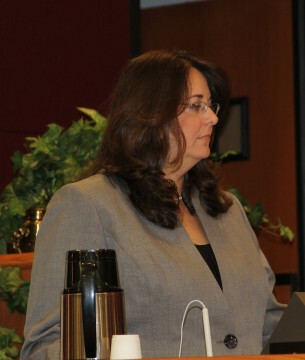 Paula Wiggins, the county’s transportation planning manager, said that funding for the signal retiming effort is included in the county’s current fiscal year budget, but staff had to complete an agreement with the Florida Department of Transportation (FDOT) for that agency to undertake the work. Following the discussion, the commissioners voted unanimously to call for the in-depth staff analysis of the ATMS. After poring over the report, which was delivered to the board on Dec. 15, Robinson told the News Leader she still had questions. Moreover, “there needs to be a public explanation of the program and expectations [of it] … in alleviating traffic congestion,” she said. The report says, “Each phase of the program has added new signal locations to the ATMS network for monitoring and control,” along with new technologies as they become available. The first three phases — from 2009 through 2014 — involved 163 signals and cost $14.9 million, the report adds. Phase 4, with 50 signals, began in 2012 and is still under way. Its cost is $8,388,000. 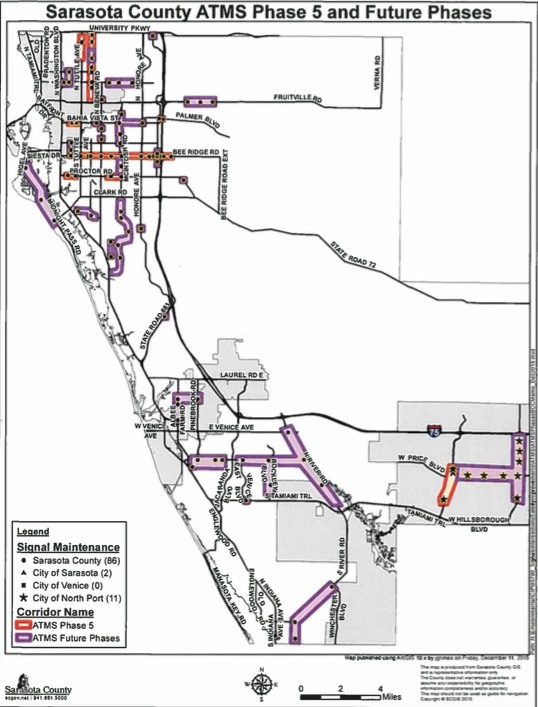 It points out that Sarasota County staff has programmed most of the county’s intersections along arterial and collector roads with timing patterns based on the needs for each specific location. “These intersections are either linked to each other with telecommunication lines or coordinated by clocks,” the report adds; then the intersections are sequenced with each other based on the traffic flow patterns on the corridor. 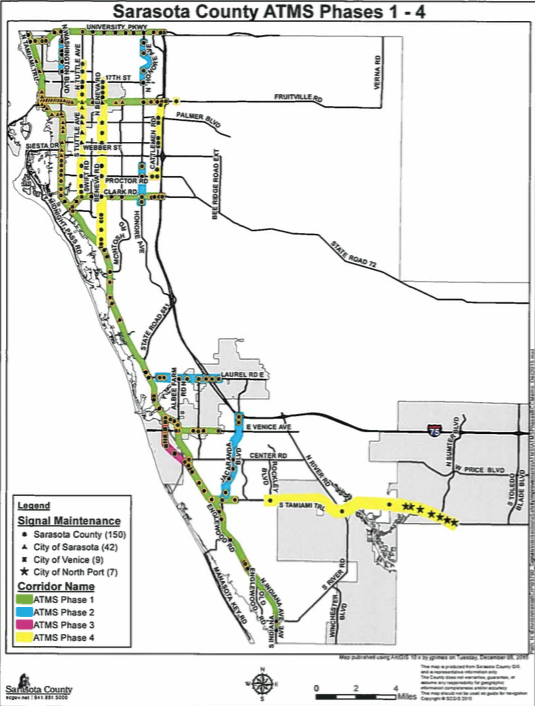 Among those corridors are Bee Ridge Road from Interstate 75 to Shade Avenue; U.S. 301 from Desoto Road to Oak Street; Clark Road from I-75 to Sarasota Pavilion; and Fruitville Road from I-75 to East Avenue. “FDOT has also programmed a new county-wide signal timing project for [the 2016-17 fiscal year] in the amount of $1,400,000 through the MPO,” the report says, “with the actual study and implementation time window estimated as January 2017 to March 2018.” That project will include the City of Sarasota, the report notes. Equipment for the latter program has been installed and will be functional along the University Parkway corridor in March of this year, the report adds. So far, all I have seen are longer and longer light cycles, more permitted left turns at small intersections and a general slowing of traffic on streets like Tuttle, important routes to and from downtown. My travel time has doubled.